In search of marlin? Tarpon? 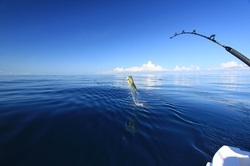 No matter what your preferred catch is, you are guaranteed to have an adventure while deep sea fishing in the Caribbean. Puerto Rico is home to some of the best deep sea fishing in the world. Just a few short miles from the northern coast lies the deepest portions of all of the Atlantic Ocean. Deep water mean BIG fish! Deep sea fishing is one of our favorite things to do in Puerto Rico! Transportation is available from many locations for activities in Puerto Rico. Please contact us for pricing. Cancellations due to weather conditions is at the fishing captain’s discretion. Please call the day before your fishing trip if you need an update. You may cancel by 10:00am the day before your charter without penalty. All guests must be at marina a half hour prior charter; if not, your credit card on file will be charged in full and a reschedule fee of $25.00 per person will apply to change date. Please be advised that all fishing trips travel in open waters that may not be appropriate for pregnant women and children under 3 years of age. Feel free to call us the day before your trip to get a update on water conditions. By booking any activity listed on this website you are acknowledging that PR Vacation Helpers is not responsible for any accidents.